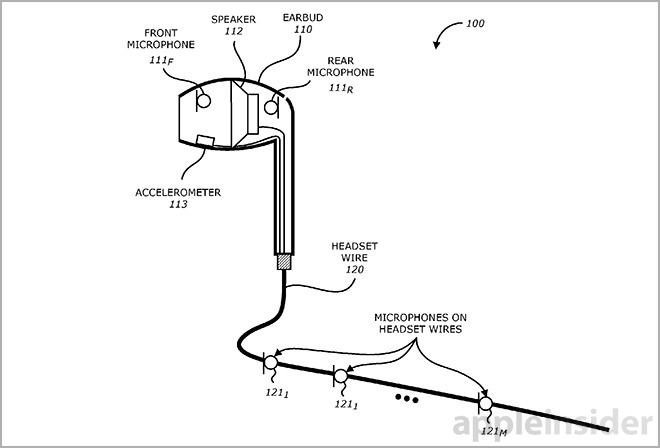 Apple on Tuesday was granted a patent covering water-resistant iPhone speakers, hinting at a potential ruggedized handset, as well as a property detailing bone conduction technology that might one day deliver advanced noise cancellation to EarPods headsets. Granted by the U.S. Patent and Trademark Office, Apple's U.S. Patent No. 9,363,589 for a "Liquid resistant acoustic device" details a protected audio port similar in form and function to a water-resistant component first introduced with Apple Watch. In various embodiments, the invention calls for a specialized mesh "umbrella" to be disposed between an acoustic port, such as a speaker, and beneath apertures in a device housing. A similar arrangement can found in the current iPhone, which boasts a mesh-covered loudspeaker accessed through six portholes. The acoustic module is coupled to its host device by an o-ring or similar mechanism, thus creating a tight seal. When liquid passes through the housing apertures it makes contact with the protective mesh umbrella and is directed away. This flow might reduce pressure on the mesh layer, thereby lowering the potential for damage. Apple notes the mesh may in some configurations be allowed to pass a certain amount of liquid at significant pressure to avoid structural harm. Apple's system can be further optimized by applying a hydrophobic coating to the outer mesh umbrella, and a hydrophilic coating to the inner surface. The hydrophobic layer, which can also be applied directly to iPhone housing structures, acts as a line of defense against unwanted ingress. If this barrier is breached, a hydrophilic coating applied to the inner mesh surface helps draw liquid out. Other embodiments include a second mesh layer that completely covers chassis apertures, alternative acoustic device orientations, varying combinations of surface coatings and modified mesh material manufacturing methods, among other design considerations. Whether Apple plans to incorporate its water repelling tech into a shipping product remains unclear. As mentioned above, a similar design is already in service with Apple Watch, but the company has yet to "waterproof" its popular iOS device lineup. A rumor last year claimed the upcoming "iPhone 7" would boast some form of weather resistant technology, though subsequent conflicting reports have put those assertions in question. Apple's water-resistant acoustic port patent was first filed for in July 2014 and credits Jesse A. Lippert, Anthony S. Montevirgen, Brad G. Boozer, Nikolas T. Vitt and Rex T. Ehman as its inventors. Apple was also awarded U.S. Patent No. 9,363,596 for a "System and method of mixing accelerometer and microphone signals to improve voice quality in a mobile device" on Tuesday, describing a headset that relies on bone conduction technology to more effectively filter out ambient noise. 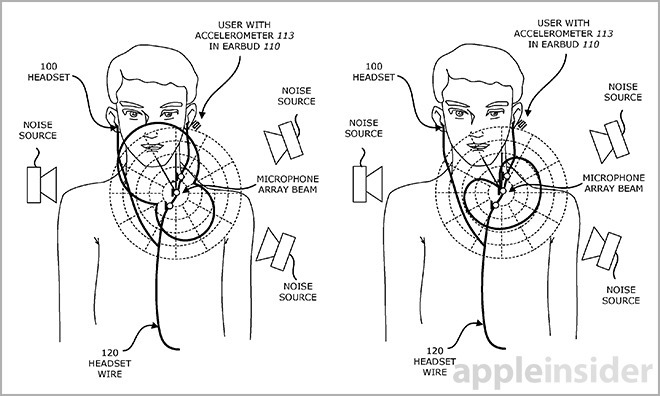 As AppleInsider reported when the application was first published in 2014, the now granted patent describes an earphone device outfitted with accelerometers capable of detecting vocal chord vibrations that propagate through a user's skull. With the help of an onboard microphone, the system measures output signals and parses out non-vocal noise to distinguish voiced speech from ambient vibrations. Accompanying the accelerometer-based voice activity detector is a microphone array that constantly monitor acoustic signals for a user's voice. Mic signals are passed through conditioning and amplification channels to detect voiced and unvoiced speech. Output data from both VAD systems are compared, contrasted and run through noise cancellation processing to output a clean signal for transmission. As with the liquid repelling acoustic device patent above, Apple's intentions for its bone conducting technology are unknown.